OXFORD, Miss. – Ten University of Mississippi freshmen have been named recipients of Omicron Delta Kappa’s Freshman Leadership Awards. The annual ODK Freshman Leadership Awards, which identify outstanding freshman leaders and community servants, were presented at the organization’s annual induction ceremony in April. Previous recipients have gone on to serve in roles such as Associated Student Body president and Student Activities Association director, and to be inducted into the university’s student Hall of Fame. 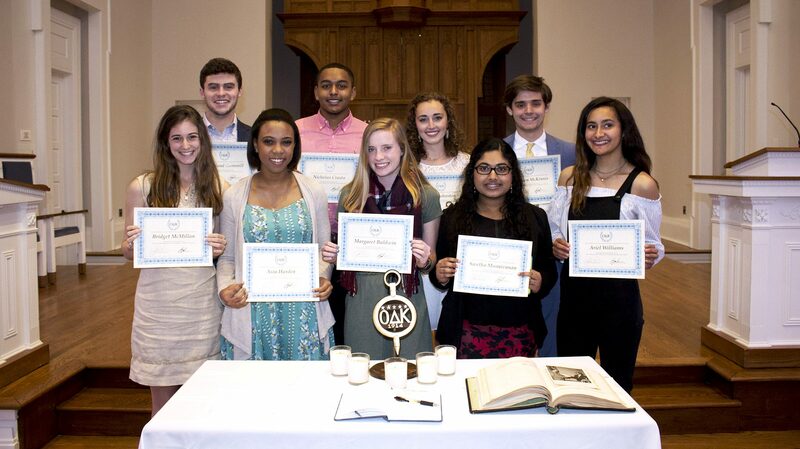 This year’s recipients of the ODK Freshman Leadership Awards are: Margaret Baldwin, of Birmingham, Alabama; Nicholas Crasta, of Vicksburg; Jacob Fanning, of Philadelphia; Kneeland Gammill, of Memphis; Asia Harden, of Greenville; Abby Johnston, of Madison; Swetha Manivannan, of Collierville, Tennessee; Harrison McKinnis, of Madison; Bridget McMillan, of Long Beach; and Ariel Williams, of Waynesboro. “We created this award in 2010 to recognize the future leaders on our campus and to encourage their continued engagement in campus and community activities,” said Ryan Upshaw, ODK adviser and assistant dean for student services in the School of Engineering. “Each year, the selection process becomes more difficult as the university attracts student leaders from all over the country. McKinnis, a chemical engineering major and graduate of Madison Central High School, said he is honored to be a recipient of the award. Baldwin, a chemistry major, is a member of the Sally McDonnell Barksdale Honors College, where she received the Parker Memorial Scholarship. As an incoming freshman, she attended the MPOWER Leadership Conference, and she is a member of the Student Activities Association, Ole Miss Running Club and the Baptist Student Union. Crasta, a Provost Scholar, is studying biology and political science. He attended the MPOWER Leadership Conference and served as a legislative aide for the Associated Student Body Senate. He is a member of Men of Excellence, the Black Student Union and Lambda Sigma. He is serving as an orientation leader this summer. A biology and political science major, Fanning is a Provost Scholar and member of the Chancellor’s Leadership Class. He serves on the Ole Miss Mock Trial Team and is a member of ASB Freshman Forum. He is serving as an orientation leader this summer. Gammill, a business and public policy leadership major, is a Provost Scholar and member of the Center for Manufacturing Excellence and the Lott Leadership Institute. He is a member of ASB Freshman Forum, the Ole Miss Cycling Team, Alpha Lambda Delta and Lambda Sigma. Harden is a member of the Honors College and is studying integrated marketing communication. She attended the MPOWER Leadership Conference and is a member of ASB Freshman Council. She was a team leader for the Big Event and is a staff writer for the Ole Miss yearbook and a member of the Chancellor’s Leadership Class and Lambda Sigma. A member of the Honors College, Johnston is studying public policy leadership as part of the Lott Leadership Institute and the Mississippi Excellence in Teaching Program. She is an ASB senator and an ambassador for the Lott Institute. She also serves as a pre-college programs counselor for the Office of Outreach and a member of the Chancellor’s Leadership Class. Manivannan is an international studies and Spanish major as part of the Honors College and Croft Institute. She serves as secretary of the Residential College Cabinet and the UM Collegiate DECA chapter. She is also a member of the Model United Nations team, the Indian Students Association and the ASB Freshman Council. McKinnis is a member of the Honors College and the recipient of the Stamps Foundation Scholarship. He attended the MPOWER Leadership conference and is a member of the ASB Freshman Council, Lambda Sigma and the Chancellor’s Leadership Class. He is serving as an orientation leader this summer. An accounting major, McMillan is a member of the Honors College and the Center for Manufacturing Excellence, where she serves on the Student Advisory Board. She attended the MPOWER Leadership Conference and serves on the ASB Freshman Council. Williams is pursuing a degree in biomedical engineering as part of the Honors College. She is a member of ASB Freshman Council and Alpha Epsilon Delta, and participated in RebelTHON and the Big Event. She is serving as an orientation leader this summer. Omicron Delta Kappa is a 104-year-old leadership honor society that has initiated more than 300,000 members since its founding. The society has more than 285 active chapters at colleges and universities across the United States.